St. Louis is a Great Town for Sports Fans! Posted by Brian Enright on Tuesday, July 11th, 2017 at 12:13pm. One of the things St. Louisans love to boast about when it comes to their city is their sports teams. Of course everyone knows about the World Series winning Cardinals, and for those who prefer the ice, the St. Louis Blues deliver with playoff fervor for die-hard hockey fans. What's great about St. Louis is that no matter which team you support (or both!) you can live within walking distance of all the action. Beginning at Ballpark Village (BPV)—the hub of everything baseball—that high energy Cardinal’s culture abounds. This combination sports and entertainment venue represents the core of what baseball truly means to the city. Located directly across the street from legendary Busch Stadium, BPV offers entertainment with nightly live music events, concerts, the Cardinals Hall of Fame, as well as a number of clubs, pubs, and restaurants. And certainly you can’t forget the center of the St. Louis baseball universe: Busch Stadium itself. Christened in 2006 with a Cardinal win over Milwaukee, the stadium known as Busch III, proved even luckier as the Cardinals won the World Series that opening year. For those looking to live right near the action, there are a number of high rise and condo options all within close proximity to the pride of St. Louis. The Syndicate, within a 10 minute walk, offers luxury amenities and, at 17 stories high, great views of the city. In these condos, high end is the theme with units featuring hardwood floors, stainless appliances and even a private heated parking garage. Step outside and experience a furnished courtyard and rooftop deck. Another great choice is the Meridian Lofts (pictured left). An old warehouse conversions, the Meridian marries modern and sleek with still a hint of the industrial. And with unit sizes ranging from 700 sq ft all the way to a very spacious 3000 square feet, there is bound to be a loft that perfectly fits your needs and budget. St. Louis is about more than just baseball. The Scottrade Center is home to the very popular St. Louis Blues, and it too is in within easy walking distance of some great downtown lofts including the Dorsa Lofts (pictured right). Once a garment factory, the building and its lofts maintain that turn of the century feel while offering residents plenty of modern amenities. You might also consider Terra Cotta Lofts. With a more contemporary feel than some of the older loft conversions, these residences feature extra tall windows which serve to bring in natural light and of course offer owners expansive views of downtown St. Louis. Every sports fan carries that distinctive connection, that innate sense of pride when it comes to their hometown team. St. Louis certainly gives its hometown fans something to be proud of. 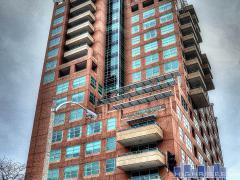 So if you want to live close to the energy and excitement then consider a downtown St Louis condo or loft. Hi! I thought you might be interested in this Property listing I came across. Check it out and let me know what you think.